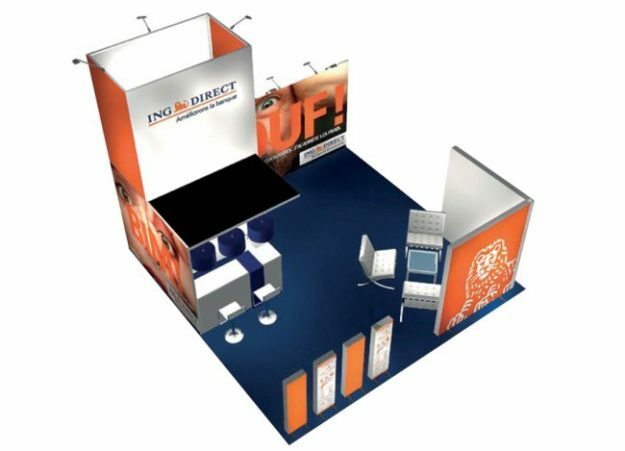 We offer an extensive selection of trade show displays, which yes, can be overwhelming but that is why we are here! Let us help you narrow down your options to perfectly fit your budget and your vision. This section highlights featured exhibit designs so that you can select trade show displays based on looks and function. 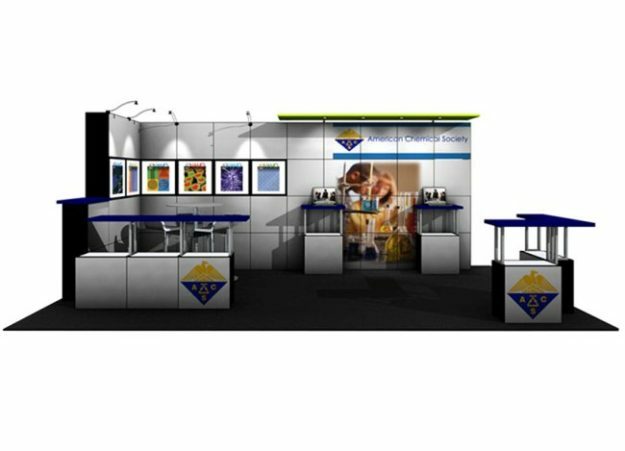 You can also access our exhibit design galleries through the list below to browse through similar booths. The trade show displays below are examples for your inspiration; however, we can customize any environment to fit your needs. Nuestros clientes de habla hispana: contáctenos con seguridad, ya que les atendemos en Español. Clean and showy. Contemporary 10-ft exhibit with product shelving and display, coupled with large LED monitor under key message and eye-catching graphic (standard or LED backlit). Locking laminate front counter with additional product display. 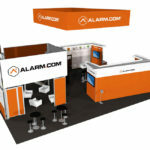 Especially ideal for modern exhibitors with a product to sell. 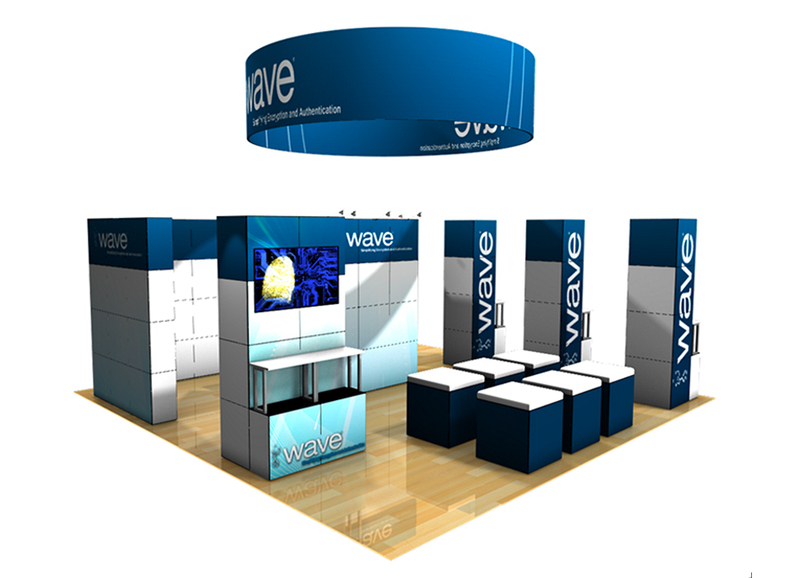 Curved graphic backdrop with column for messaging, monitor and shelving. Front graphic and laminate counter with iPad mount. Perfect layout for small presentations, especially ideal for that circular logo icon. Then choose your custom flooring and seating solutions. Curving canopy, curving wall details and curving counter in this exhibit because a straight one might not be so much fun! Accessories for this display include LED monitors, literature holders, product shelving and custom signage for your event. 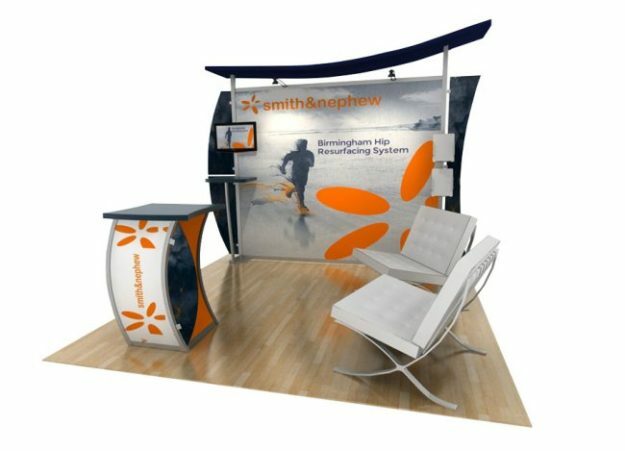 Self-locking pop-up exhibit with full graphics and column for LED monitor, interactive tablet and company literature. Many ways to customize. For example, counter conversions, shelving and other functional elements. Bright and good looking. 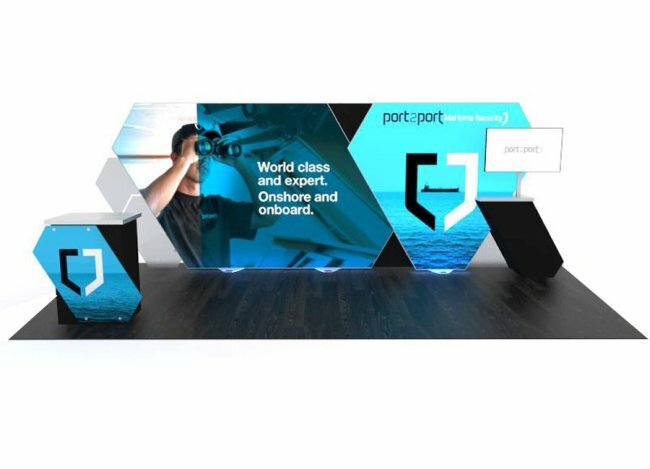 Lighten up with an LED back wall with SEG graphics for an eye-catching display. 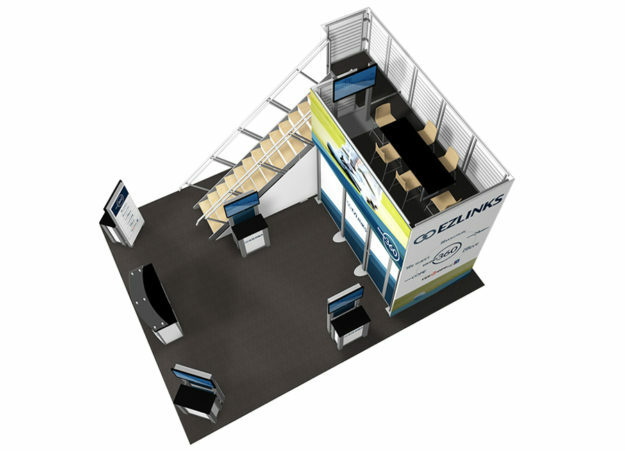 Then add a counter, kiosk, showcase or a seating area to complete your booth space. Framed SEG graphic exhibit includes half-walls towards the aisle for an encompassing design. 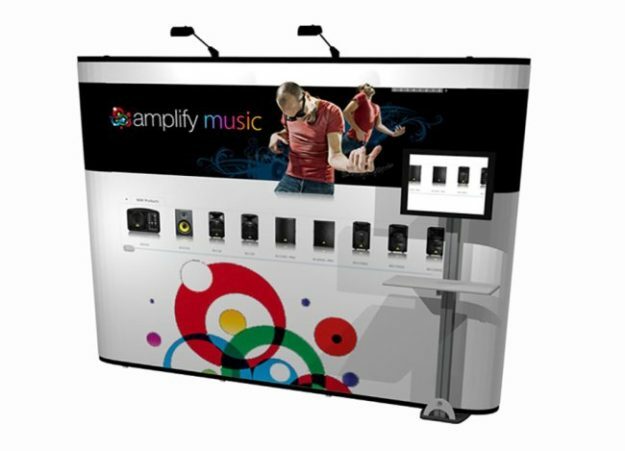 Add-ons include not only counters and shelving, but also LED monitors, iPad and tablet enclosures. Tool-free assembly and great looks make this exhibit a Perfect 10. Frame colors: red, blue, black, yellow, green, white and silver. Additionally, all the usual accessories complement this stand. Fabric pop up exhibit with countless messaging possibilities due to the various ways the graphics can stretch over the structure. Counter graphic wrap over suitcase so that you can Xpress yourself! Interchangeable frames and Quads ™ give you freedom to change images, messages and configurations in seconds. 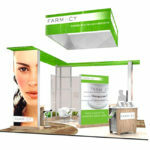 Furthermore, integrate shelving for product display, back-lit graphics, showcases and media easily into this design. 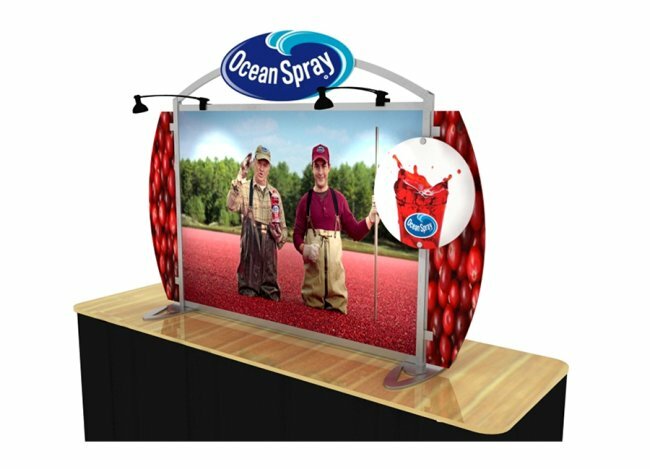 10-ft Instand self-locking pop-up with all graphic panels, a long-term best-seller that assembles in minutes. LED fixtures, stand-off graphics, integrated monitor stands, literature holders and many more options complement this stand and make it a versatile trade show exhibit. 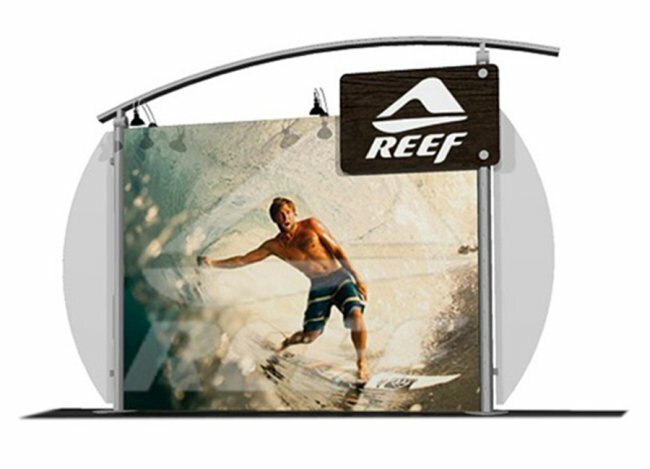 10-ft fabric display in pillowcase design, dyesub tailored graphic can be printed single-sided or two-sided, and slides over frame to zip close for a smooth finish. Don’t like them straight? This system has curved, angled and asymmetrical shapes and can be layered with kiosks and other accessories for functional benefits. 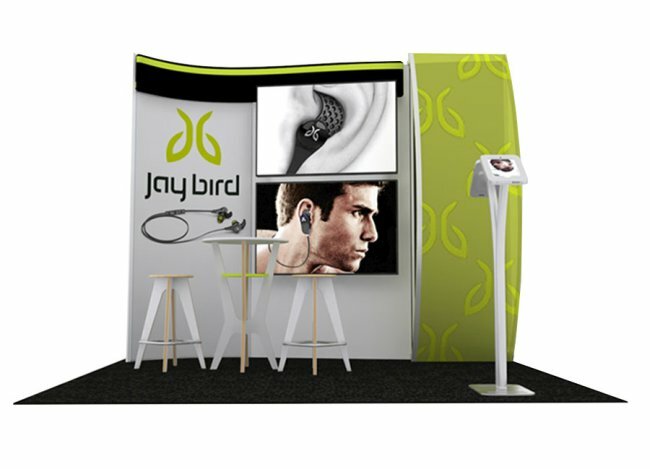 This curving display is anchored by the large center LED monitors and adds function with tablet stands to complete the presentation. Portable branded furniture kit shown. 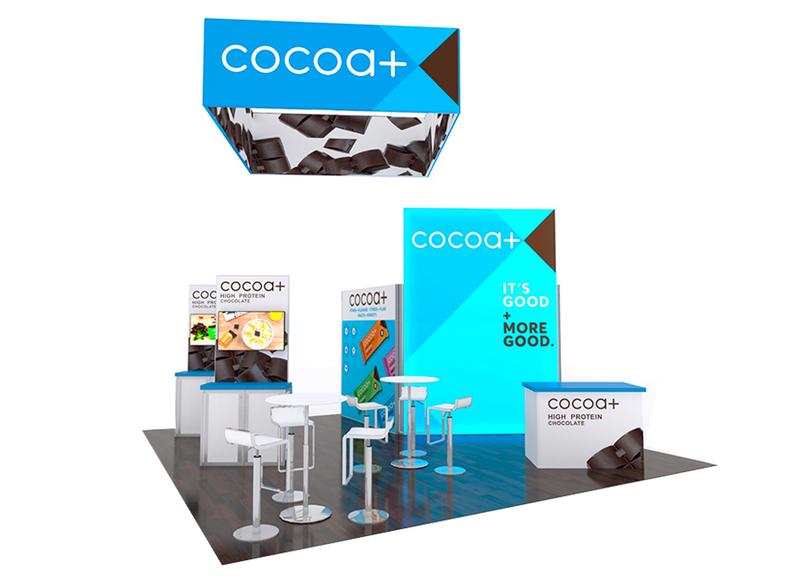 Other trade show exhibit options include counters, literature stands and customized flooring. 10×20 inline exhibit with the right angles. 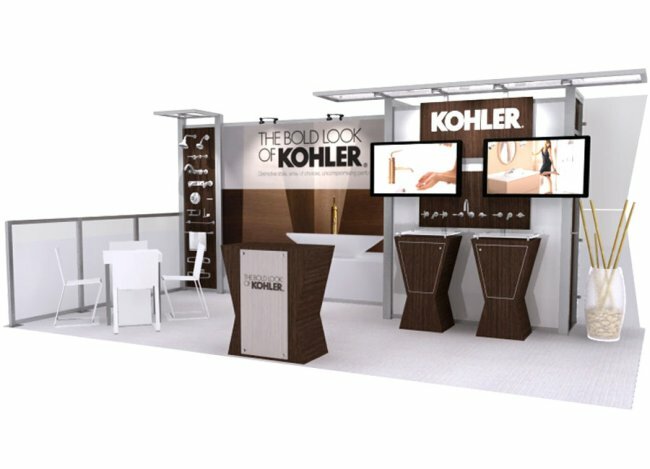 Custom combination of dual monitors, locking storage closet, product display area and conference area half wall will make you feel fearless. 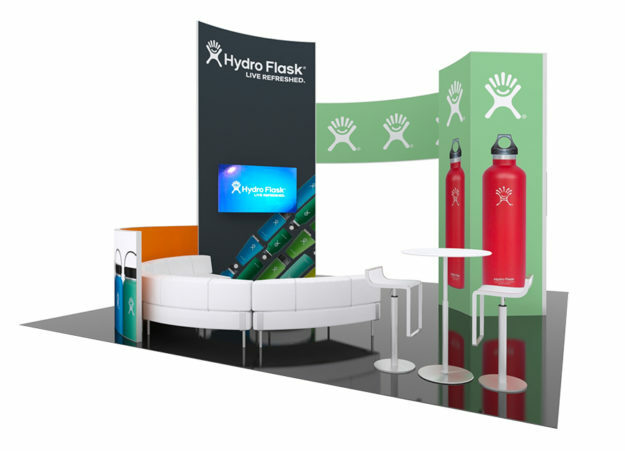 10×20 exhibit with SEG tension fabric graphic background with closet and inviting open seating area. Can be back-lit. Front counters offer easy demo areas while custom flooring enhances your space. 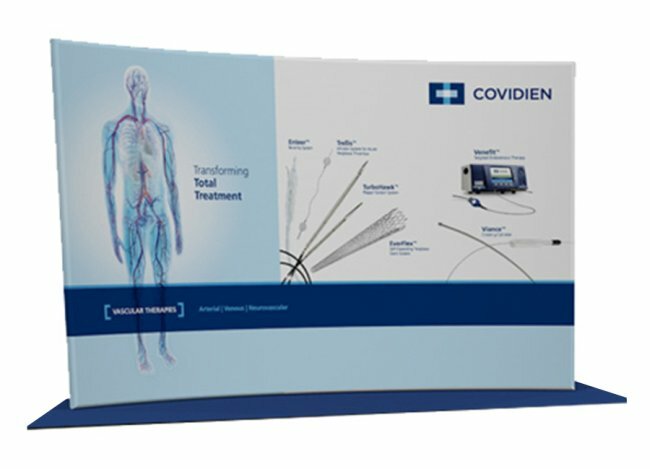 10×20 inline exhibit with cutting edge LED technology and attached large monitor. Layered design with angled elements. Breaks down into a 10-ft exhibit. 10×20 portable FabLite pillowcase exhibit packs in only one rolling case. 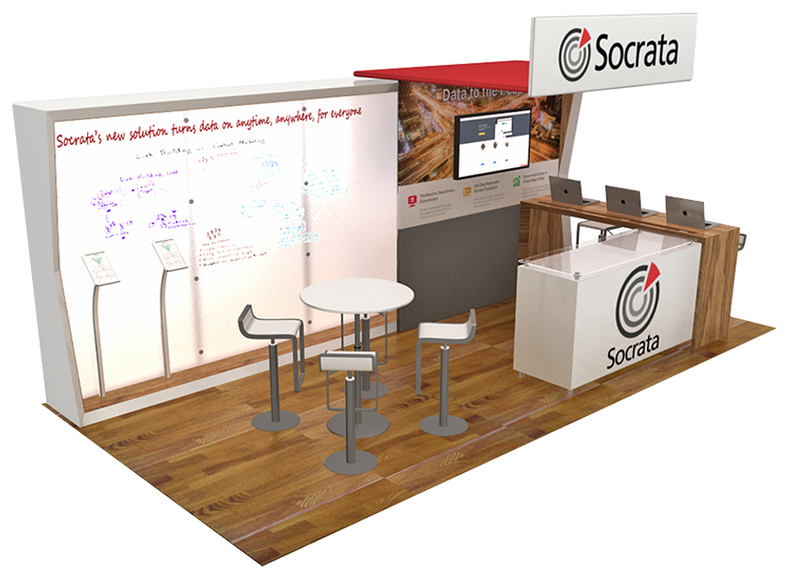 Since the design uses two 10-ft frames together to create a 20-ft graphic back wall, you can start small or go big. 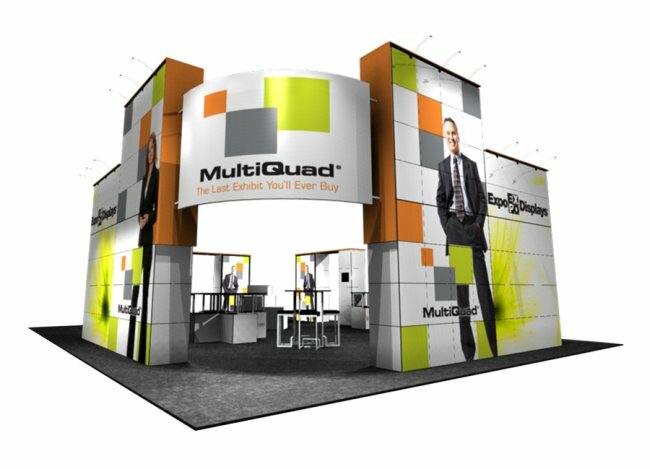 10×20 Multiquad exhibit lets you move squares around to change your message. Because of its back-lit graphics, straight canopy and side wall, it makes a visually interesting combination. 10×20 custom modular environment to meet, present and power up. 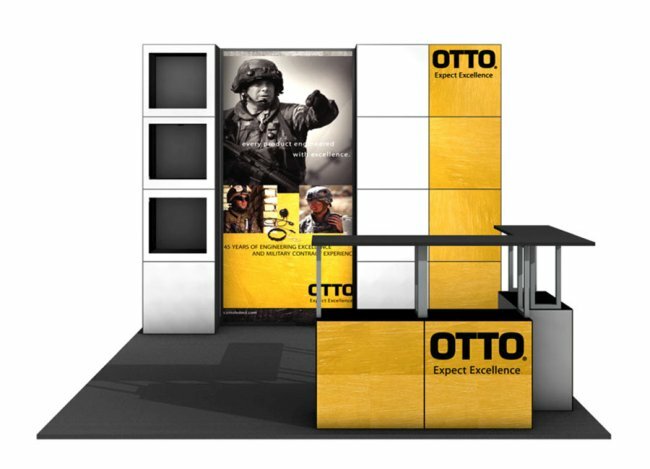 Acrylic backlit panels, wood and engineered aluminum structure, tension fabric structures, custom counter and charging stations, tablet stands. Who said you can’t do it all in 20? 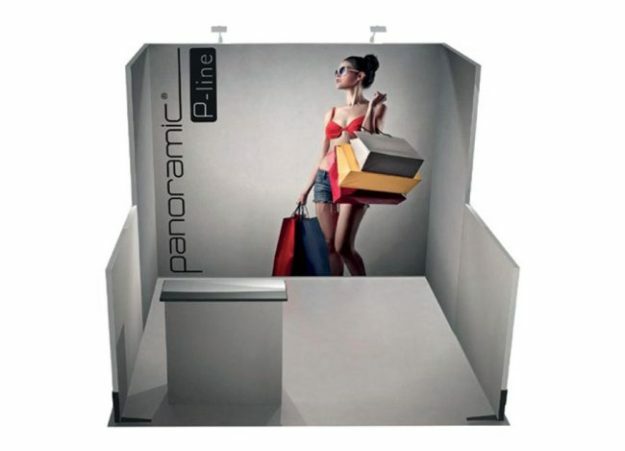 10×20 visual system exhibit creates a panoramic view of your graphics by covering 100% of the surface. Have a lot to say or want to show more? This design uniquely conveys your message. 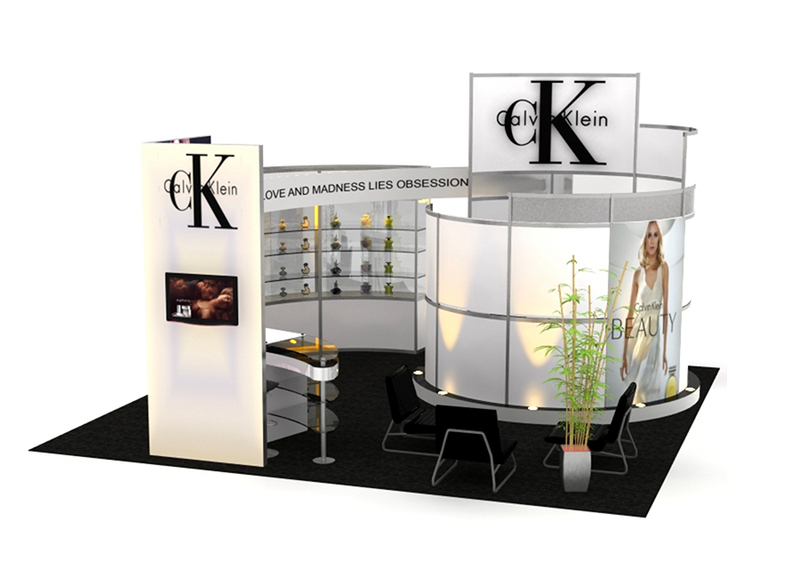 10×20 curving exhibit with large screen and closet. Come lounge in this easily custom, modern environment with charging station table. 20×20 Nomadic Display modular island with tiers of demo areas to help you channel in your ideal customer. Perfect as a peninsula, especially ideal for conversion to 10×20. Design includes backlit graphic walls, integrated monitors and laminate counters. Then add custom flooring, iPad stands and other accessories to make it all your own. 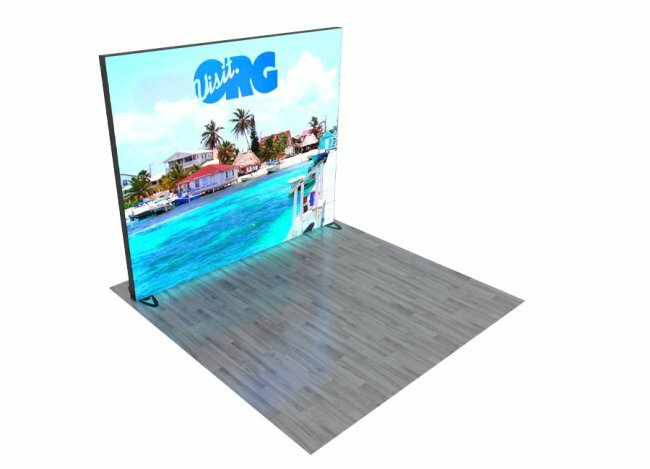 20×20 comfortable island trade show display with tall back-lit Versawall graphics, integrated monitors kiosks on opposite corners, semi-private meeting area. In addition, this design allows for corner visibility with open floor plan, a hanging sign and extended canopy. 20×20 Dynamic Duo Displays island with back-lit corner lounge area, LED lighted canopy over hospitality counter, and two-sided back-lit graphic columns. 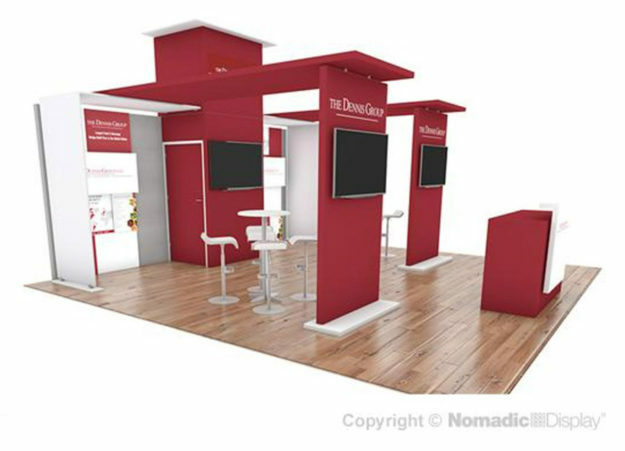 Design includes a tower for brand visibility, locking closet and presentation backdrop. 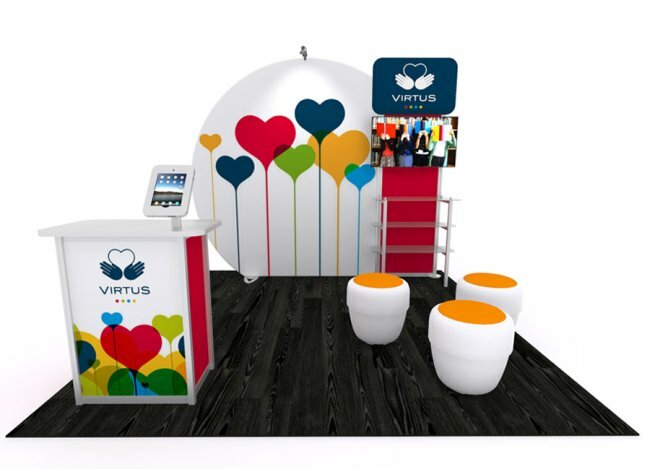 Brighten up your trade show displays with this design! 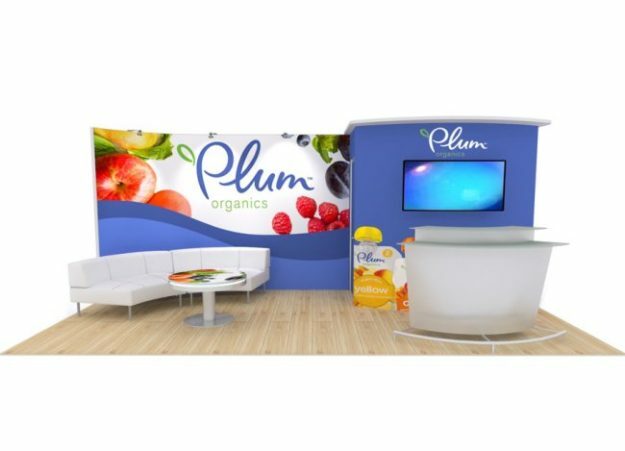 30×40 Impressive Multiquad island design with large graphic walls and corner entrance. Great visibility and scale, open floor plan inside or create your own traffic flow. 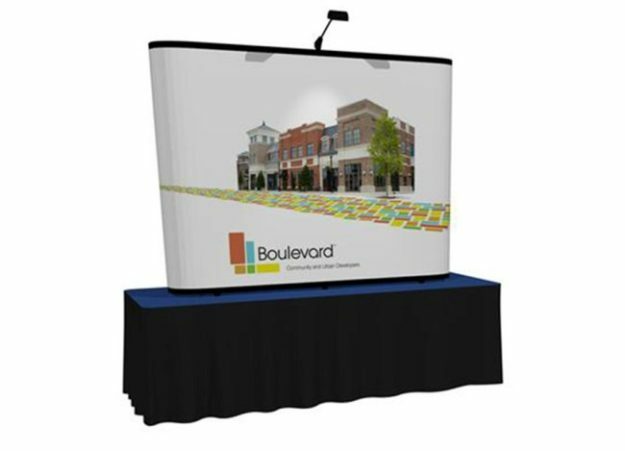 Ideal for vehicle and large product presentations. Since you can easily change configurations you can make the most of your investment with this design. 20×20 island glows with 15 ft. High SuperNova™ Double-sided LED light boxes, tower closet with locking door, bar counter with storage, square hanging sign. In addition, Gravitee Modular system is made in the USA. 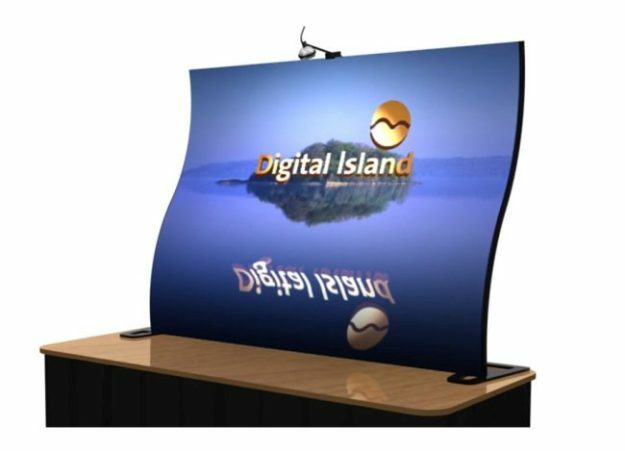 20×20 island featuring new bendable light wall system by Nomadic Display lets you express your message differently. Customized central circular counter for tablets, presentations and monitors. Corner meeting areas. 20×20 Fun angled Classic Gravitee one step modular exhibit system stand, including 144″ high LED backlit main wall with conference room, kiosks with integrated monitors and hanging sign for increased visibility. If presentation is an important part of your process, then this island exhibit is ideal for you! Reconfigurable design with columns, integrated monitors and cube quad seating. 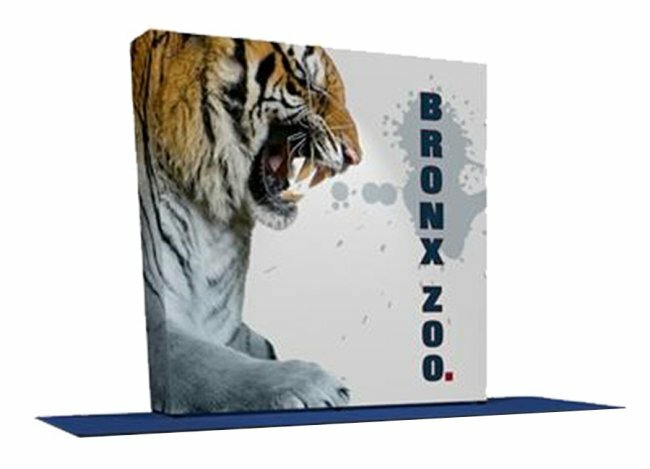 20×20 island exhibit with a 2-sided custom product display showcase and meeting room with uplighting, frosted panels and large graphic. 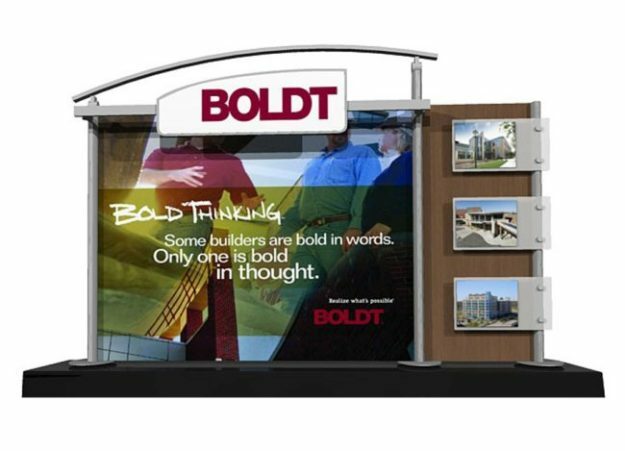 Bridge, header signage and back-lit towers add brand visibility. Integrated monitors. Many accessories available to make this uniquely yours. 20×20 curving island structure creates a beautifully simple space that allows for lounge meeting area, presentation area with front desk, a locking closet and impressive graphic real estate. Accessories available include tablet stands, literature holders, customized flooring and more. 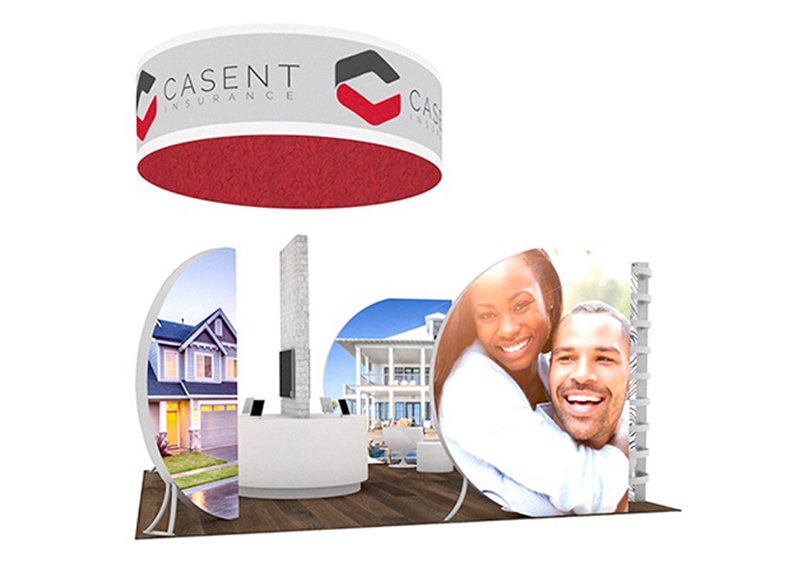 Small two-story base exhibit rental (or purchase). 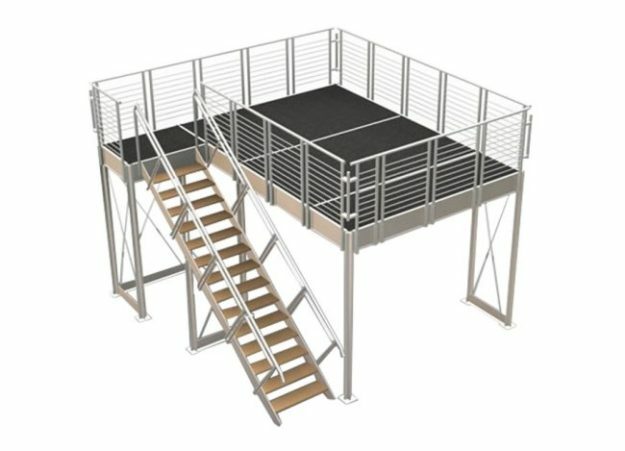 This aluminum Double Deck Structure is 5 M x 2 M (196″ x 78.75″). Modular Assembly. 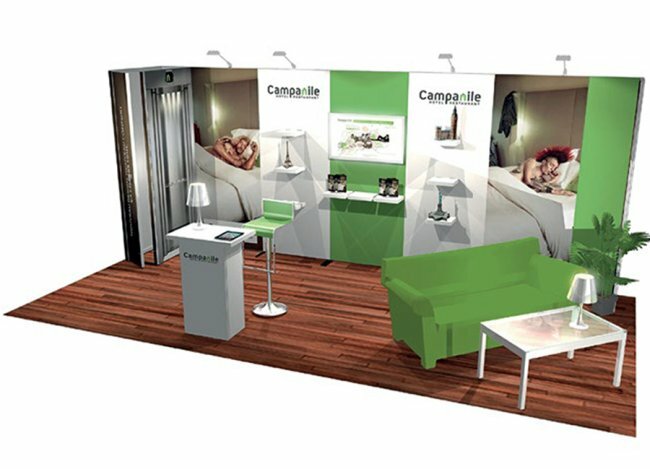 under staircase storage, modular walls, specialty lighting, kiosks, meeting area integration, large scale signage, graphics, flooring and furniture and accessories. Medium two-story base exhibit rental. 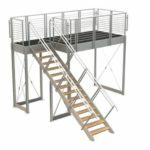 This aluminum Double Deck Structure is 5 M x 5 M (196″ x 196″). Modular Assembly. Large two-story base exhibit rental. This aluminum Double Deck Structure is 6.5 M x 6 M (256″ x 236.5″). Modular Assembly. 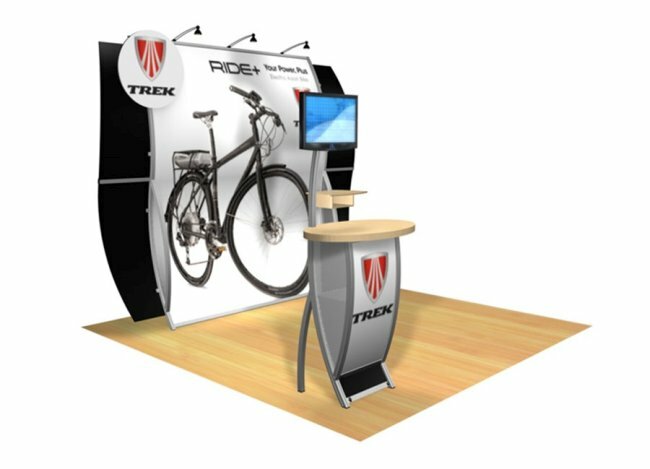 We can also design custom two-story trade show displays to your specifications. For example, details for double-decks include specialty lighting, closed conference rooms, integration into other structures, back-lit graphic walls and storage. 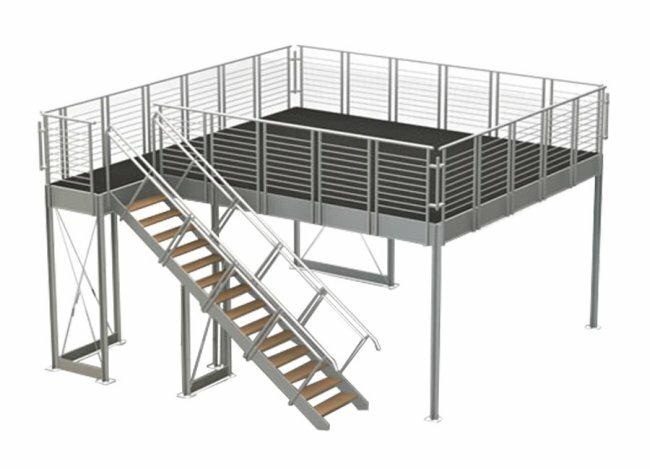 If a custom solution is what you need, then contact us to discuss your project. Tension graphics on tubular framework. 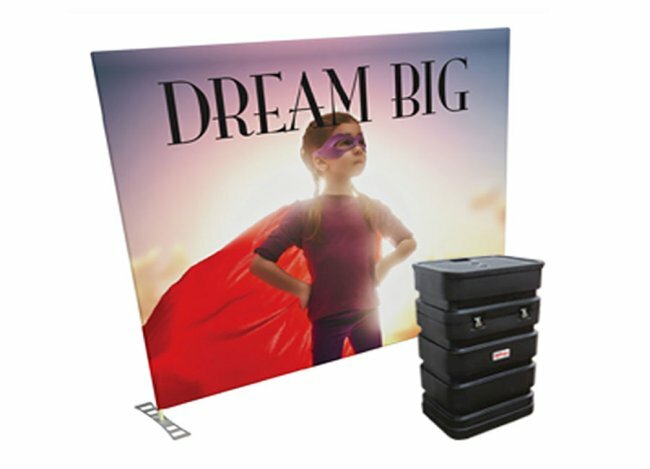 68″ W x 48″ H x 14″ D, packs in portable fabric case with wheels, so that it’s easy to transport and set-up. 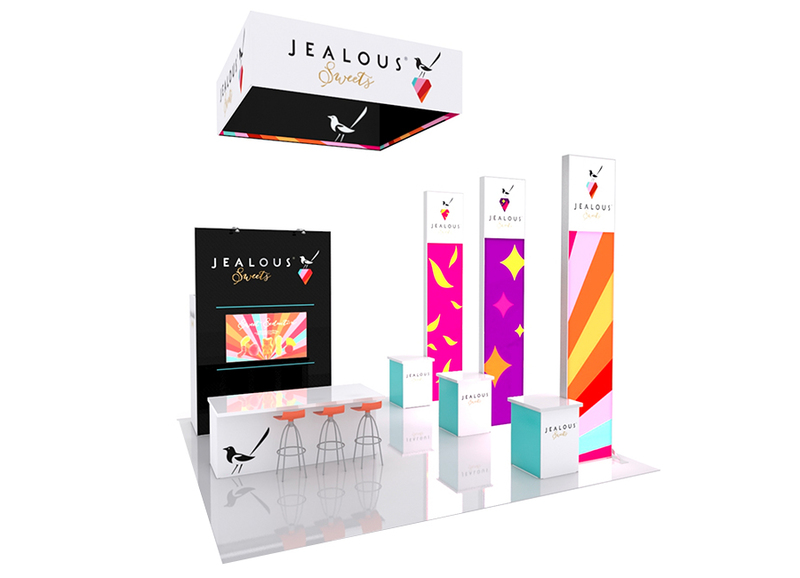 Modular tabletop display including center graphic, logo panel, interchangeable graphic and customizable wings. 73.75″ W x 47.25″ H x 22.25″ D, packs in portable fabric case with wheels. 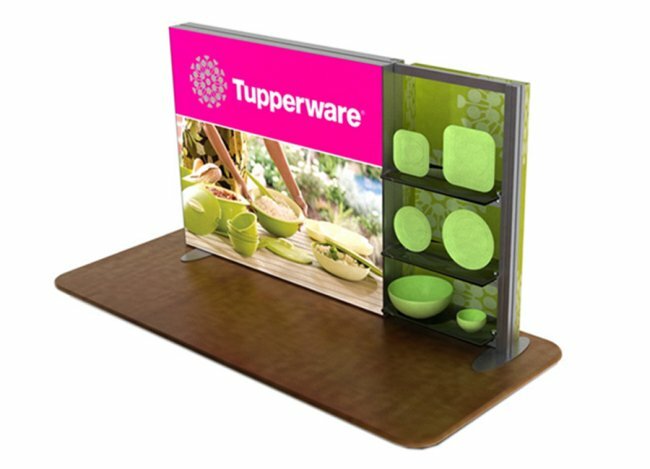 Large SEG backlit graphic with side product shelving. Engineered aluminum extrusion, 40″ H x 67″ W, packs in portable roto-molded case with wheels. 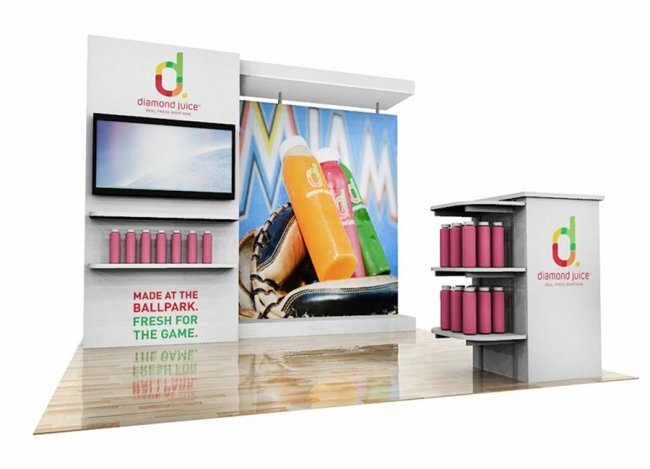 Nomadic Display pop-up fabric tabletop trade show displays with end caps, backed by the industry’s best “No Questions Asked” lifetime warranty, 5.3′ W x 5.3′ H x 1′ D; packs in rolling case. 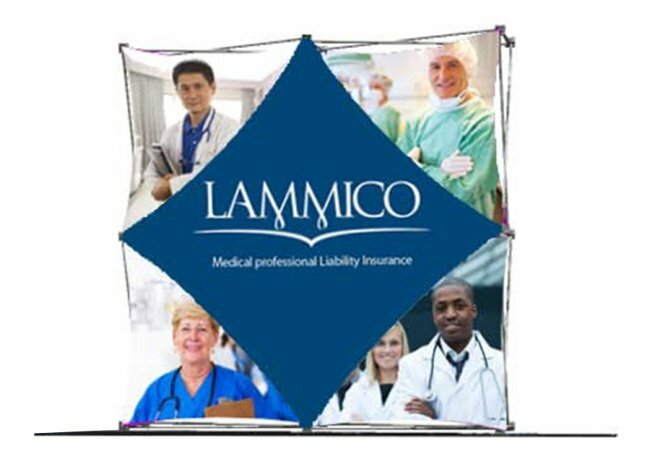 Tabletop with interchangeable fabric panels on XPlus frame, backed by the industry’s best “No Questions Asked” lifetime warranty. 5.4′ W x 5.3′ H x 1.2′ D. Pack in rolling packing case. Eco-friendly tabletop with recycled fabric graphic and eco glass frosted wings. LED light fixture for added visibility. 72″w x 54″h x 22″d, packs in regrind flat panel case. 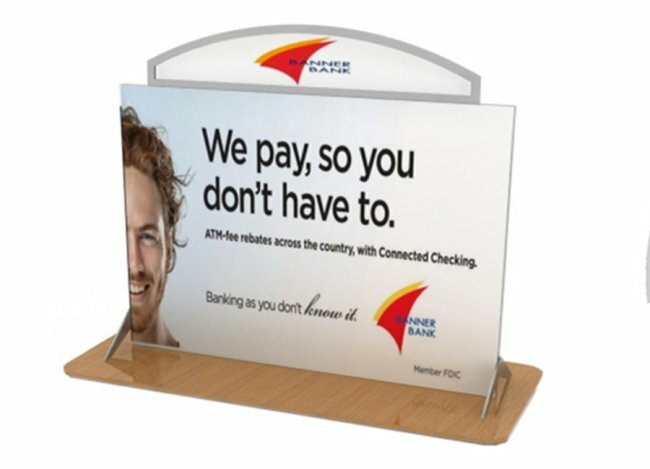 Instand popup tabletop with rollable graphic panels, backed by the industry’s best “No Questions Asked” lifetime warranty. Although it is placed on a 30″ H table, it has the presence of a floor model. 7.2′ W x 5.3′ H x 1.2′ D, packs in rolling case. 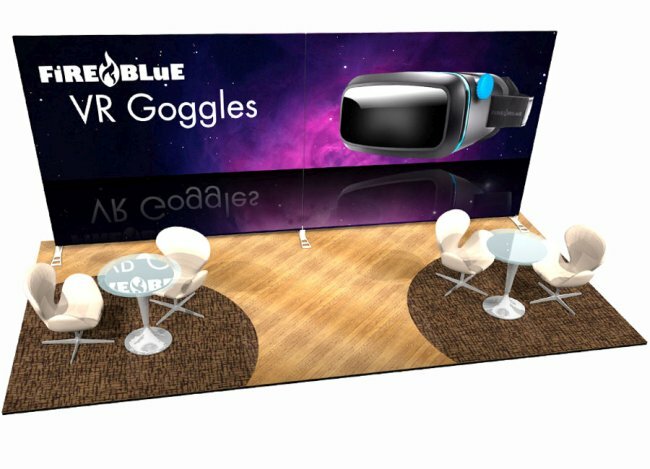 Fablite tabletop trade show displays pack in its padded shoulder bag and have tool-free assembly, therefore perfect for easy set-up. Pull graphic over frame and zip it up, just like a pillowcase. 6′ W x 3.5′ H x 0.75′ D.
Taking it to the edge. 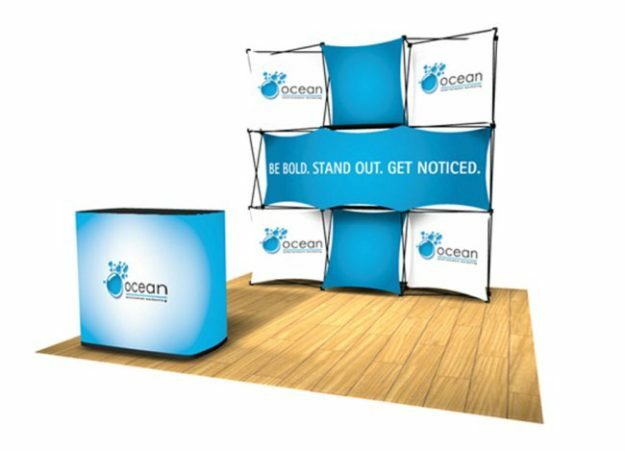 Silicone edge graphic, tension fabric header and tool-free assembly make this a popular choice for trade show displays. 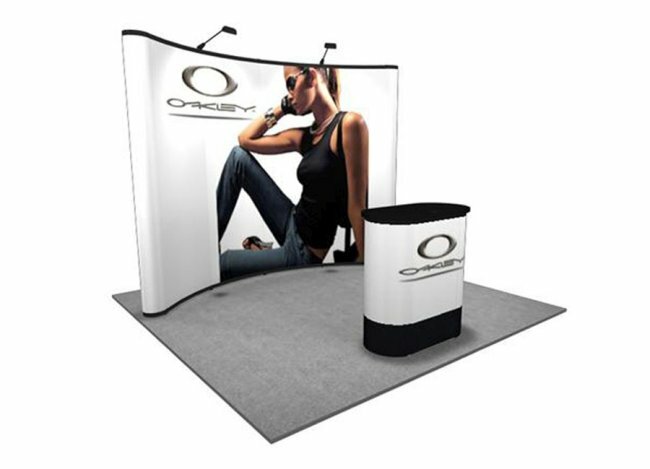 63″ W x 52″ H. Add a stretch branded table cover to complement the modern design.